Aaron Temkin Beck was born on July 18, 1921, in Providence, Rhode Island. He was the youngest of five children. Beck went on to graduate from Brown University in 1942 where he majored in English and Political Science. He then earned his M.D. from Yale University in 1946. In 1950, Beck married Phyllis W. Beck and the couple went on to have four children. His daughter, Judith S. Beck, is also an influential ​cognitive-behavioral therapist who also serves as the President of the Beck Institute for Cognitive Behavior Therapy. Beck spent much of the early part of his career studying and researching psychoanalysis, particularly in the use of the treatment of depression. After a few years of practicing psychoanalytic therapy, Beck began to find that the approach lacked the scientific rigor, structure, and empirical evidence that he desired. 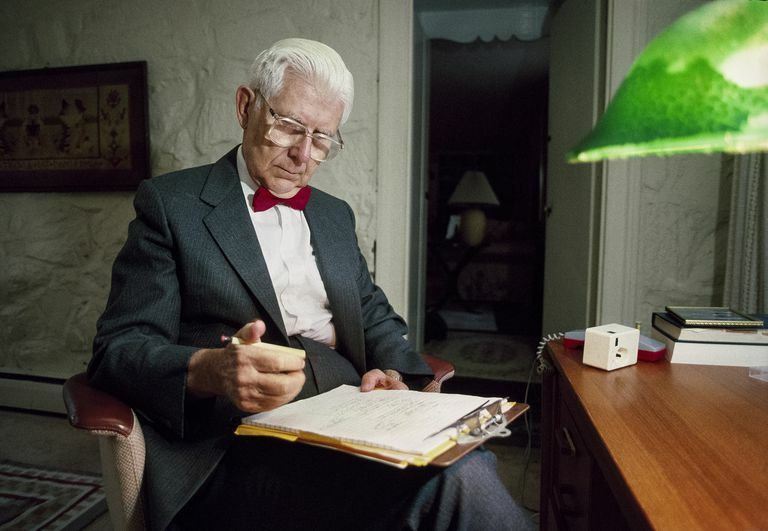 His interests shifted to the cognitive approach, and his research in this area intensified after taking a job in the psychiatry department at the University of Pennsylvania where he established a depression research clinic. What Beck discovered was that his depressed patients often experienced spontaneous negative thoughts about themselves, the world, and others. Patients who ruminated on these thoughts then began to treat them as valid and accurate. His focus soon shifted to helping patients identify these negative automatic thoughts and replace them with more realistic and accurate thoughts in order to minimize distorted thinking patterns that contribute to depression. Successfully treating any disorder, Beck found, involved making patients aware of these negative thought patterns. This approach to treatment eventually became known as cognitive-behavioral therapy (CBT). Beck is widely recognized as the father of cognitive therapy. American Psychologist named him as one of their five most influential psychologists of all time. In addition to his widely used assessment scales, Beck has published more than 600 professional papers and 25 books over the course of his career. Beck has also received numerous honors for his work including five honorary degrees, The Lienhard Award from The Institute of Medicine for his development of cognitive therapy, and the Kennedy Community Health Award. He has also been called one of the most influential people in mental health and one of the ten most influential people to shape the course of psychiatry in America. Today, he continues to serve as the director of the Aaron T. Beck Psychopathology Research Center as well as a Professor Emeritus at the University of Pennsylvania. His work has influenced numerous psychologists including Martin Seligman and Judith S. Beck. Beck, A.T. (1972). Depression: Causes and treatment. Philadelphia, PA: University of Pennsylvania Press. Beck, A.T., Freeman, A., & Davis, D.D. (2003). Cognitive therapy of personality disorders. New York, NY: Guilford Press. Beck, A.T., Emery, G., & Greenberg, R.L. (2005). Anxiety disorders and phobias: A cognitive perspective. New York, NY: Basic Books. Clark, D.A., & Beck, A.T. (2010). Cognitive therapy of anxiety disorders: Science and practice. New York, NY: Guilford Press. Aaron T. Beck, M.D. Perelman School of Medicine, University of Pennsylvania. Smith, D. B. (2009). The doctor is in. The American Scholar. Spicher, A. R. (2008). Beck, Aaron Temkin. Pennsylvania Center for the Book.